Even in his lifetime, John Singer Sargent was aware of the critical rap against him: all flash, no substance - indeed, serious modernists still frown at the mention of his name. But he wasn't much interested in his critics. "I don't dig beneath the surface for things that don't appear before my eyes," the artist shrugged, and when he pondered the likes of Cézanne or Gauguin, he simply sniffed, "My sympathies lie in exactly the opposite direction." And even if he was all flash - ah, what flash; Sargent could dash off a précis of optical experience with an off-hand élan it would have taken most painters a lifetime to master. And yet he made no effort to cloak the sources of his effects: like a magician who lets the audience watch the trick from backstage, Sargent leaves his pencil lines showing through his pigment, actually draws focus to the picture plane, and basically lets his paint fall where it may. It just always fell in precisely the right place. And yet he never got egg-heady about his technique (perhaps because it came to him so easily). When it came to the brush-stroke as a self-conscious glyph, or as some intellectual call-to-arms (or indeed when it came to the entire French-revolutionary delusion that undergirds so much of modernism) - all this was alien to Sargent. Like the modernists, he was opposed to illusion; yet unlike them, he used this stance to openly trade in illusions of a particularly potent kind: the type that floats before your eyes of its own accord, even though the wires are in plain sight. In the end there was simply a direct line between his mental pleasure center and his painterly hand - whose every virtuosic gesture seemed to flip the bird to the avant-garde. For this alone - for being a great painter who didn't care about "Great Painting" - the public has always adored him, and always will. 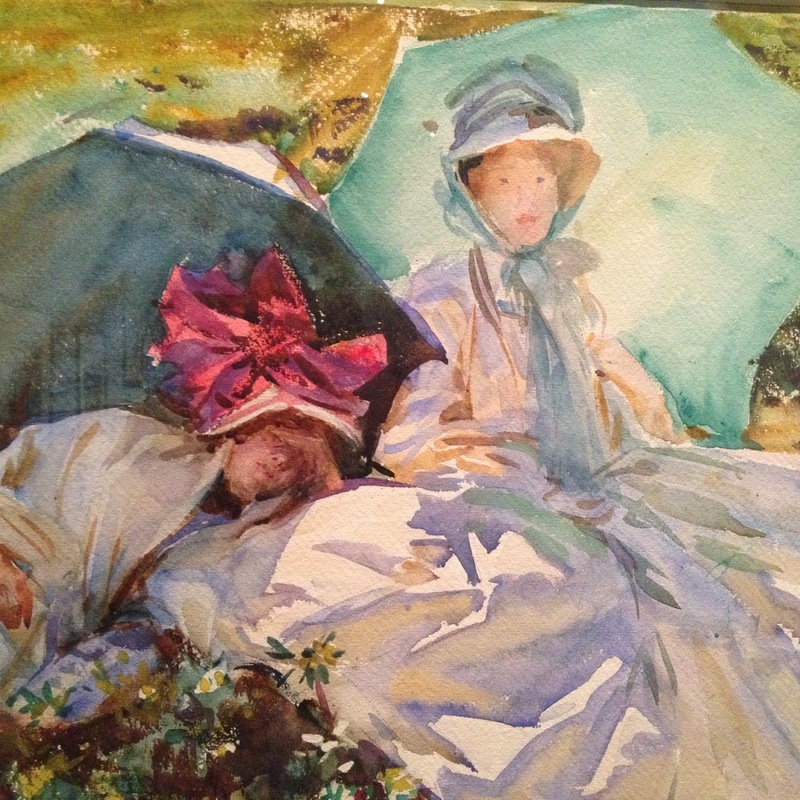 The most recent consummation of this long affair has been the traveling exhibit "John Singer Sargent Watercolors," which closes this Sunday at the MFA (so hurry). But the show may intrigue even some Sargent skeptics, as it pulls together two remarkable collections of the artist's watercolor oeuvre (one from Boston, one from Brooklyn), and thus represents a rare opportunity to survey something like the arc of his achievement in the form. But come to think of it, that impulse is entirely appropriate, as the pictures themselves were painted on holiday - usually someplace sunny (the show's sobriquet might be "John Singer Sargent and the Sun"), with nieces, sisters, servants, and a variety of props in tow; these peregrinations over Italy, the Alps, and even the Levant amounted to a years-long vacation from the society-portrait grind that had made the artist famous (and moderately wealthy). 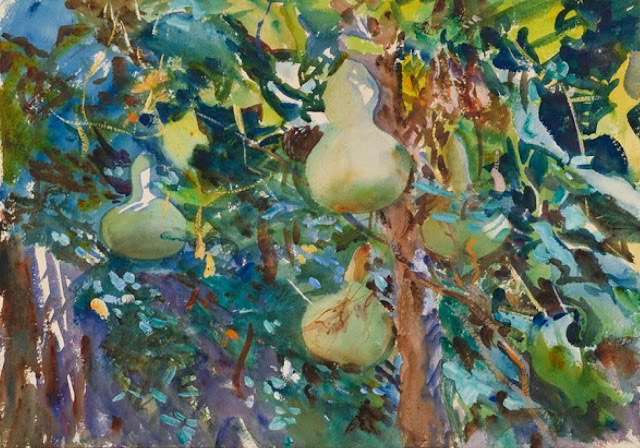 Indeed, Sargent apparently never intended to put the fruits of these labors up for sale (although eventually he was persuaded to sell them in blocks, first to the Brooklyn Museum, and then the MFA). Thus, perhaps, their atmosphere of privacy and freedom - here Sargent is at play, daring himself almost daily with yet another technical challenge, and topping himself again and again. No doubt he understood that watercolor represented the ideal arena for testing his own gifts. Its transparency, and the speed with which it dries, make it a famously unforgiving medium, particularly en plain air, where artists have to contend with not only their own level of ability, but vagaries of light and atmosphere, and even the local fauna. And while a wash or stroke in watercolor is easily adjusted, it's hard to erase or cover up; thus spontaneous command is the sine qua non of a master. Each gesture counts all the more when you can't take it back, and when the clock is always ticking. And another, subtler kind of alchemy comes into play: so much of this imagery was worked on the fly - while the paint dried - that the very passage of the moment is somehow embedded in the pigment, and we seem to see these scenes in terms of time as well as space. It's odd, however, to ponder how different the prevailing attitude toward the medium was in Sargent's own day. The MFA show includes a few samples from the period (including works by Edward Darley Boit, whose daughters Sargent famously painted, and the painter/critic John Ruskin), and these are almost startling in their limpid conservatism. They're lovely, no question, but bent on small-scale effects - and even on the kind of delicate detail that the medium itself seems to want to fight. Sargent, in contrast, broke the form open into the mix of splashy gesture and loose representation that still holds sway today. He builds his images of great swaths of light and shadow (see the cascade of white cotton in Simplon Pass above); indeed you could argue that light itself, rather than watercolor, was his true medium. (This is why the desert was as fertile a site for his art as water-logged Venice.) And certainly he understood the luminous face of shadow as no other painter ever has. 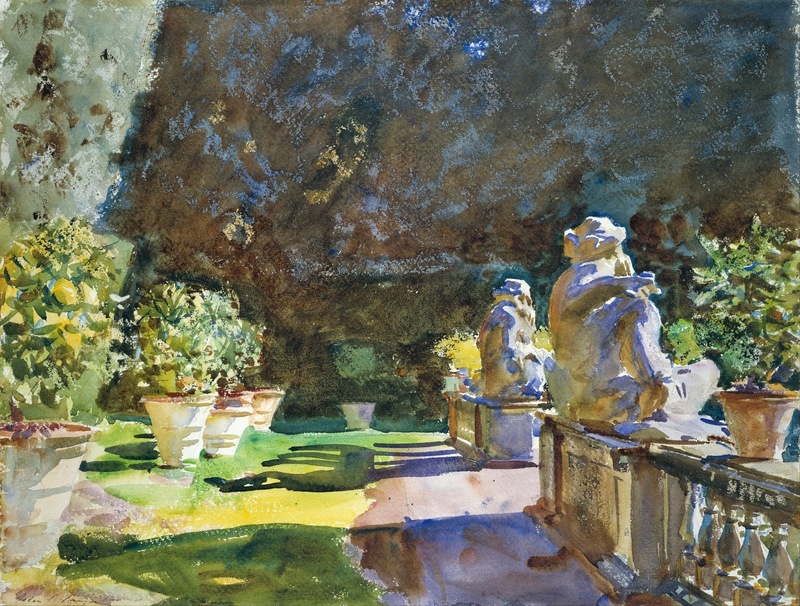 The glowing orb of a parasol against the sky, the gleaming web of waves on the bow of a boat, the etched glint of a statue's arms against its grotto - no impressionist ever caught these subtleties with the economy of Sargent; startlingly, he captures reflected hues with the same precision as primary ones. And what oft appears a muddy riot of color in close-up always resolves itself into a carefully-observed cavern of foliage, or a confluence of sea-currents, when viewed from a few feet away; at one point in this show, my partner whispered to me in astonishment, "Were his brushes ten feet long?" Perhaps - but I doubt it. The more likely explanation is his preternatural painterly awareness - which pushed his work in all sorts of predictive directions. Indeed, given that he was considered all but retro in his own day, Sargent proved strangely prescient about the pictorial culture that would follow him. Along with Degas, for example, he all but predicted the snapshot, with its askew point-of-view. 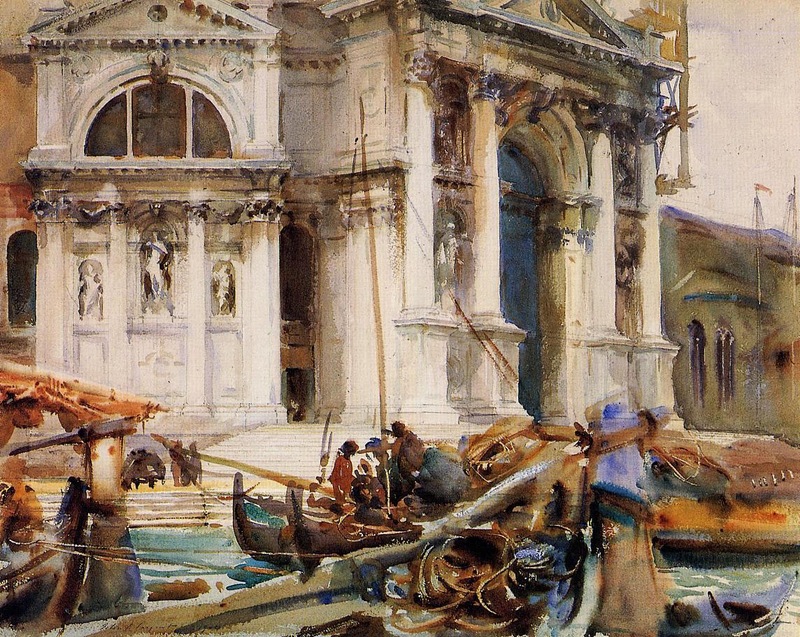 And decades before Duchamp, Sargent was an avatar of the time-lapse - in many of his views of Venice (like the one of Santa Maria della Salute, at top), the architecture is conveyed with clean, timeless lines, and precisely controlled washes - while the motion of life itself is a splashily overlaid blur. Likewise the smeared foliage around his too-too-solid "Gourds" (above) seems to be almost trembling with the wind. And if Monet's "Water Lilies" foreshadowed abstract expressionism, Sargent is clearly a forefather of action painting - indeed, clip out a section of any of these watercolors, and you'd swear it was by Jackson Pollock. Even Sargent's ragged, wet edges seem to suggest the frames of latter-day photography. So there you have the conundrum of John Singer Sargent - immune to theory, he nevertheless developed cutting-edge effects that the theoreticians would only discover much, much later. But then Sargent was clearly after something beyond theory - perhaps something like a leisurely parallel to Cartier-Bresson's moment décisif, a luminous pause in which, for an instant, everything is possible, even if nothing is actually happening. Thus he eschews all drama: he ignores the Alps for the sake of a wayward cloud, and the sun falls silently on his empty gardens (below). His subjects are more often than not prone on the ground, or lying in a nodding gondola; lounging at lunch, absorbed in a book - even simply sleeping. This isn't theory, no, far from it; it's more like existence itself.